Have you been approached by a customer who has an ID size photo file in his USB thumb drive and requesting that it be printed on a photo paper that approximates the size of a bond paper? This is equivalent to increasing the size of the image by eight (8x) times and we all know that right-clicking the image file, copy-paste to an open document file and stretching it to the desired size will not do the job because it will produce an image with “square-square” in it. Opening the file using GIMP software and using its image scale function may also result to “pixellated” image that is not good to the eyes if printed. What then do you need to do so as not to lose the sale? I was recently faced with similar scenario when some of our sponsors’ logos that we need to print on large-size tarpaulins came in at very small file size and stretching them using image manipulation software would not produce the desired results. I know that there are some proprietary plugins to Adobe Photoshop that can do it but I am neither using Photoshop nor do I have such expensive plugin. I had to google for free solution to my problem and got results which not all gave satisfactory results. I found two free software solutions which I would like to share with you on this article. First is the free online solution called Reshade Online which has an easy to use interface that can re-size images up to three (3x) times from the original resolution. When using the free online service, you need to upload the image from your computer. Once you have uploaded the image you can choose the resolution you want to re-size it to. You also have the options to center the image, stretch it and more. There is also the Reshade desktop resizing tool that you can buy and the software allows you to easily re-size images from the confines of your desktop. You can either use the zoom option or enter in a size that you want the new image to have. In addition, you can also control the quality, smoothness, texture, accuracy and threshold of the re-sized images. Second, and the one that I have now is a desktop image resizing called VSO Image Resizer which you can download and use for free on a personal basis. Aside from enlarging images up to 1600 x 1200 resolution, this free image resizing software can also create e-mail friendly versions of images that load faster. 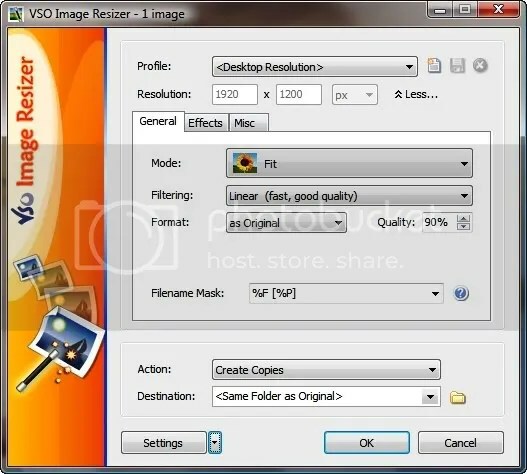 When VSO Image Resizer is used, images can be moved easily from folder to folder, their format changed and the software can edit large numbers of image files into smaller size and thus save space on your hard drive.